The Future Stands Still but We Move in Infinite Space brings together a group of artists who all challenge our perception and create an awareness of how different elements are entangled in a network of relations. With: Andrew Amorim, Ane Graff, Juan-Pedro Fabra Guemberena, Toril Johannessen & Marjolijn Dijkman, Kamilla Langeland and Jenine Marsh. Dataesthetics focuses on a new aesthetic paradigm emerging from the ongoing revolution in data visualization. 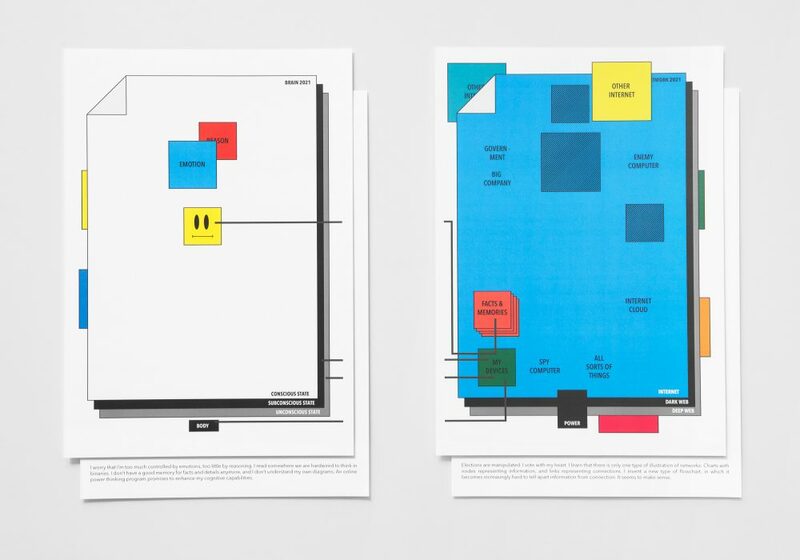 In a veritable sea of data, where the mathematical sublime as conveyed through Big Data influences how we read the world, graphic designers tasked with schematization become modern-day oracles, enunciators of knowledge and visual rhetoricians. The exhibition presents artists’ epistemological reflections on data collection and processing, the construction of knowledge and the rhetorical power of data visualization. Covering a wide spectrum of approaches ranging from craftsmanship and community art to digital and logarithmic modelling, Dataesthetics looks at the representational techniques developed to make sense of today’s world. Curated by Gentiane Bélanger. Artists: Richard Ibghy et Marilou Lemmens, Toril Johannessen, Katie Holland Lewis, Jeannine Mosely, Phillip David Stearns, Colleen Wolstenholme. 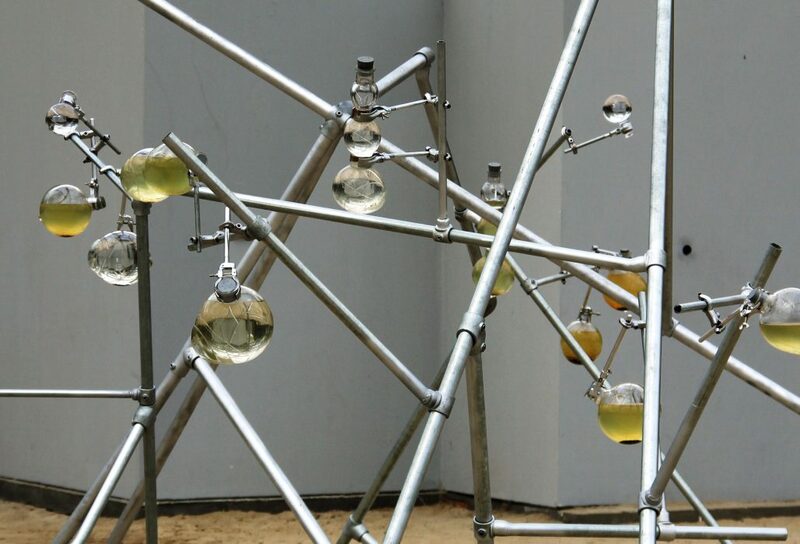 The sculptural installation Liquid Properties, realised in collaboration with Marjolijn Dijkman, is currently on view at Verbeke Foundation, a private art site where culture, nature and ecology go hand in hand. The installation consist of hand blown glass objects in a variety of shapes reminiscing of lab equipment glassware, buoys, ecospheres and water lenses. The glass objects are containers for samples of water taken from various sources, and are held by a meandering metal framework in a laboratory like set-up. Each of the containers have one or more lenses integrated in the glass body, slightly magnifying the organisms, particles and pollutants inside. 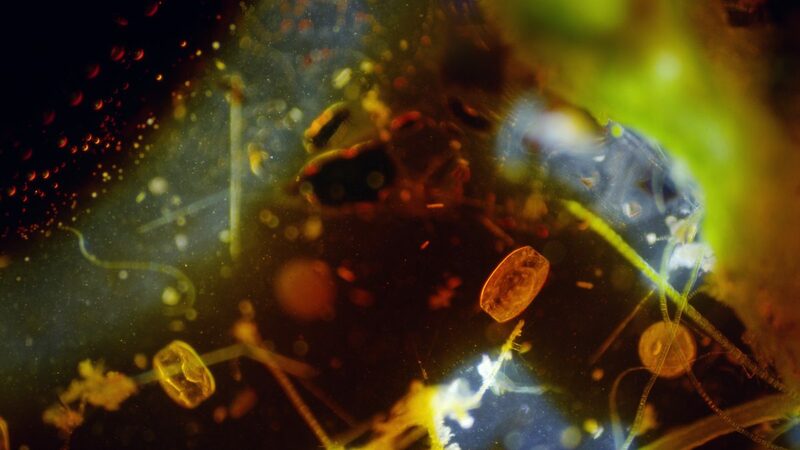 Captured through a light microscope, Reclaiming Vision features a diverse cast of microorganisms, sampled from brackish water, alongside algae, cultivated in a laboratory. The film reveals life and processes in the water that are hidden to the naked human eye. By exploring the brackish water, its inhabitants, properties, and the traces left by human activities, the film is a reflection upon the relationship we humans have with our surroundings, especially through what we cannot see. Inspired by real and historical events, the scenes have been staged by the artists, taking the presumption of reality that characterises nature documentaries into the realm of fiction film. 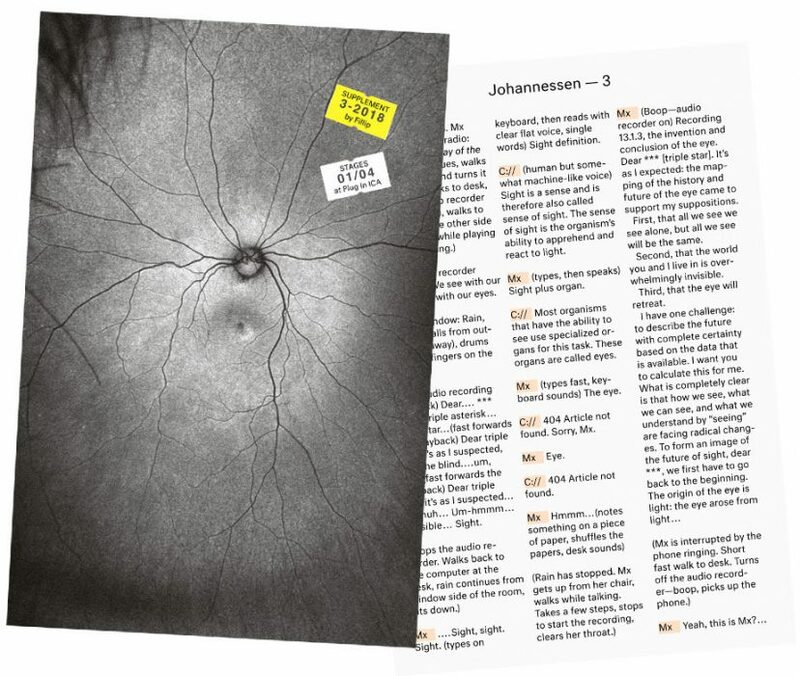 The manuscript for The Invention and Conclusion of the Eye is published as part of Supplement, an occasional pamphlet series by Filip. Produced in partnership with Plug In ICA, Winnipeg, The Invention and Conclusion of the Eye presents a possible future of human vision told through a narrative conversation between a sole protagonist and a computer. Interwoven with contemporary and historical diagrams plotting various aspects of sight, the work depicts vision as a historical construct evolving alongside technology. Published in English, Norwegian, and French.